CANCELLATION POLICY, SPECIAL EVENTCANCELLATION AND RENTAL DEPOSIT:It is expressly understood and acceptedby Guest/Lessee, that Lessor is removing such rental property from the rentalmarket, as a result of this rental reservation, and the terms of this LodgingAgreement. All Rental Deposit’s orPayment monies received from Lessee are NON REFUNDABLE unless cancelled in writing30 days prior to day of arrival. For all GROUP BLOCK bookings or special events that fall on recognizedfederal holidays or any special event bookings or group blocks, which are consideredpeak, Lessee will have 90 days in writing unlessnoted otherwise or agreed to between Lessor or lessee in writing. If Lessor is able tore-rent the cancelled dates, all monies less 25% of gross rental amount will berefunded. If less days are re-rented Lessor will subtract the difference andLessee will be responsible for the additional days not rented, in addition tothe 25% cancellation fee. Lessor is not obligated to rent fewer days than whatthe current minimums are currently set at. Lessee should not enterinto this Agreement, if they are not fully aware of, and acknowledge such, bytheir execution of this Agreement If a special event is takingplace and a special event facility feeis charged and a situation where an event is canceled anytime subsequent tothe receipt of the booking fee, the Event Fee less $500.00 shall be returned tothe Lessee. Therefore, when a RentalDeposit is required for individuals, special events, or GROUP BLOCKS, depositis due upon acceptance and execution of this Agreement. Such executed Agreement and the initialRental Deposit are due within three (3) days of the issuance of this Agreement,or the rental property will be placed back on the market, for Lease. Individualcabin rentals are due in full upon booking. In addition, the final Rental Paymentshall be due 30 days prior to Rental Commencement Date, with the followingapplicable taxes and fees. If arrival date occurs in30 days or less on the acceptance and execution of this Agreement the entire100% of the total rental amount is due. Should the final Rental Payment’s belate (as outlined above), and not received by Lessor, within Three (3) days ofthe due date, as outlined above, this Agreement shall be considered cancelled. Upon Cancellation, any and all Rental Deposit’s or Payment’s, previouslyreceived, shall be considered as Actual Damages to the Lessor, and such amountsshall fully accrue to the benefit of the Lessor. Lessor shall have no further obligations toGuest, and specifically no obligation to allow Guest access to the premises. THISIS A LEGAL AND BINDING CONTRACTUAL AGREEMENT THAT BECOMES EFFECTIVE ONCE YOUHAVE CONFIRMED YOUR BOOKING. YOUR RESERVATION WITH MINER’S CAMP IN ANY FORM CONFIRMSYOUR AGREEMENT, UNDERSTANDING, AND ACCEPTANCE TO THIS AGREEMENT. PLEASE READCAREFULLY, AND SEEK LEGAL ADVICE (as you deem necessary and appropriate). WHEN YOU BOOK WITH VRBO, AIR B&B, OR OTHER ON-LINE BOOKINGSERVICE YOU AGREE TO THE TERMS AND CONDITIONS OF THIS LODGING AGREEMENT. YOUR BOOKING AND DEPOSIT REQUIRES YOU TOREVIEW THE AGREEMENT AND CONFIRMS YOU UNDERSTAND AND AGREE TO THE TERMS BEFORECONFIRMING YOUR STAY. Assoon as we receive your booking confirmation or deposit we will remove thedates from the calendar. If Applicable, once we receive your final payment wewill send out instructions for entry to the property, typically one week priorto arrival. Our goal is to ensure yoursatisfaction. Thank you for choosing MINER’SCAMP for your vacation. We look forward to having you and hope you creatememories that last a lifetime. This Lodging Agreement entered into forand on behalf of MINER’S CAMP, LLC, (hereinafter referred to as Lessor), andthe Lessee, ___ Your Legal Nameon Booking (hereinafter referred to as Guest or Lessee),is based upon Guest leasing the Premises of 24381-24387/24361 Foresthill Road, 24370 Racetrack Street,Foresthill, CA / from Lessor, and is conditioned and subject to thefollowing terms: RENTAL TERM:The Checkout time is especiallycritical, allowing time for the home to be cleaned, prior to next usage.Failure to be out on time may cause financial damages to be assessed againstthe Lessee, (unless previously approved, IN WRITING). RENTAL AMOUNT:The Rental Nightly Rate for the RentalTerm, as set forth and included herein above or within your online bookingagreement, does not include any cleaning fees, Security Deposits, ConciergeServices, Insurance or any and all applicable Taxes, these are separate charges.These fees will be itemized accordingly on your booking as required. TRAVELINSURANCE: We highly recommend all Lessees/Guestspurchase travel insurance. CLEANING CHARGE:In addition to the above mentionedRental Amount, there is a mandatory Cleaning Charge in the amount noted aboveon the first page of money due. Thischarge is for “normal cleaning”. However, if the premises are left in an unusually messy or disturbedmanner, additional cleaning will be required. All additional cleaning costs will be charged at a rate of $50.00 perhour, for such additional hours as required to restore the premises. Any such additional cleaning costs will bededucted from the above mentioned Security Deposit. SECURITY DEPOSIT / GUEST RESPONSIBILITY:This deposit is non-interest bearing andis fully refundable, with the following exceptions: The costs for: Damage repairs, (such as, but not limited to:theft, extra ordinary cleaning, smoke damage, fire damage, liquid spillage, mudand debris on feet, stains to floor coverings, cigar and/or cigarette smoke),payments for un-paid payments to service providers, city fines incurred,special event fee’s, cost or replacements or other expenses necessary to fullyrestore the Premises and the associated property. Lessee specifically agrees to allow theaforementioned Security Deposit, to be used, by Lessor, for all such relatedcosts, and have such deducted from the Security Deposit. “Normal” wear and tear, without abuse, isexcluded. There will be charges againstyour Security Deposit for replacement of any missing items from the home.Security Deposit is refundable within approximately thirty (30) days ofdeparture, after Lessor inspects the premises (or after any damages arerepaired, per above). The SecurityDeposit refund will then be mailed to Guest, at the given address at the given or a credit card refund will beprocessed. See the Non Smoking Premises notes in the contract. DUE CAUTION REQUIRED BY GUEST:Guest does hereby accept fullresponsibility to exercise due caution with the premises, and all premisescontents (whether inside or outside the premises), and hereby agrees tomaintain such, during the Rental Term, in a reasonable and prudent manner, andto not misuse any aspect of the Premises. Should such Security Deposit be insufficient to restore and/or replacethe property and its contents, Guest agrees to pay all such costs for the fullrestoration. In the event of any damages, it isfurther agreed that the Security Deposit will not be returned until such timeas all bills are received, for extraordinary expenses incurred by Lessor, as aresult of misuse of the premises. In the case of excessive damage or loss ofinventory, where there is no remaining Security Deposit, Guest agrees to payall costs involved in restoration and/or replacement, within ten days ofinvoicing by Lessor. OUTSIDEDISTURBANCE: 10pm noiseordinance in Foresthill, CaliforniaLessor is not responsible for any noisedisturbances outside of the private property from any outside surroundingresidents. PROPERTYCARETAKER: Due to the size of the property we mayat some time have a property care taker who lives on the property in a separatehome and is there if needed to assist you during your stay with questions orissues that may arise. RETURN OF KEYS AND REMOTE CONTROLS:It is expressly understood that Guest’sfailure to return all keys and remotes to the Premises shall cause Lessoradditional expense to re-key and/or change out locks on the Premises. All suchcosts shall be deducted from the Security Deposit. Lessor will provide an itemized statement asto any deductions. Please return keys and garage door remote(s) to the initialpick up locations. LESSOR ACCESS:Guestagrees to allow Lessor, Lessor’s Agent, Lessor’s Caretakers; Lessor’s cleaningstaff and crews, maintenance crews, and Lessor’s vendor’s reasonable access tothe Premises. In the event of anemergency, Lessor or any of Lessor’s Agents shall have the right to enter theunit, without notice, for the purpose of ascertaining and assessing theemergency, and making any repairs, at any time, night or day. TERMINATION / UNFORESEEN CIRCUMSTANCES:Failure by Guest to pay rent or othercharges due hereunder, or to comply with any of the conditions pertaining tothis Agreement or contained herein shall, at Lessor’s option, forthwithterminate this Agreement. Guest shallimmediately vacate the premises upon notification of Termination. If Lessor is unable todeliver possession of the residence to Lessee on the agreed date, because ofthe loss or destruction of the residence or because of the failure of the priorresidents to vacate, or for any other reason, the Lessee and/or Lessor mayimmediately cancel and terminate this agreement upon written notice to theother party at their last known address, whereupon neither party shall haveliability to the other, and any sums paid under this Agreement shall berefunded in full. If neither party cancels, this Agreement shall be proratedand begin on the date of actual possession. Neither party shall have the right toarbitrarily terminate this Agreement, after such Agreement is fully executed byboth parties. LEGALUSAGE ONLY: Lessee agrees not to violate any law,statute or ordinance, nor commit, or permit any nuisance in, on, or about thePremises or, in any way, to annoy, molest, or interfere with any propertyneighbor’s peaceful co-existence. Lessee and/or Guest may NOT use the Premises for a Commercial Operationor Business of any type unless under written authorization from Lessor. TheLessor represents that it possesses the legal right to lease the Premises tothe Lessee pursuant to the terms of this Lodging Agreement. PERSONAL PROPERTY and INSURANCE:Lessee acknowledges that Lessor’sinsurance does not cover personal property damage caused by fire, theft, rain,war, acts of God, acts of others, and/or any other causes, nor shall Lessor beheld liable for such losses. Lessee is hereby advised to obtain his owninsurance policy to cover any personal losses in addition to property damagecoverage no less than $5,000.00, which policy may be obtained through VRBO whenbooking online and other sources. Lock up and properly secureall personal items and property. Lessor shall not be liable or responsible forany injury to any person, on the Premises or surrounding areas, during theRental Term, or for personal injury, loss or damage while Premises are undercontrol of the Guest. Unauthorized personsare not permitted entrance to the Premises. PERSONAL ITEMS LEFT, AFTER DEPARTURE:Any personal items left onthe Premises after Guest vacates the Premises shall be considered abandoned,and shall be removed and/or disposed of by the Lessor. If there is a particular item, that appearsto be of some significant value, the Lessor shall attempt to notify the Guest,for clarification. However, Lessorcannot be responsible for such, and makes no guarantee. Please, do a thorough walk thru prior todeparture of the Premises. PROPERUSE:Guests shall exercise properuse of all electrical and gas appliances, kitchen equipment, plumbing fixtures,mechanical equipment, audio visual equipment, hot tub, sauna, fire wall, arcadegames, and miscellaneous equipment. Guests shall be liable for any repair resulting from, failure to complywith these conditions. “Normal” wear andtear, without abuse, shall be acceptable to Lessor. INVENTORY:Guest agrees not to make any changes,relocations, or modifications to the Premises furnishings, décor items, etc., andfurther understands and agrees that any items unreasonably damaged or missingfrom the unit or its surround grounds, inventory will be charged against theSecurity Deposit. In the case ofexcessive loss of inventory, where there is no remaining Security Deposit,Guest agrees to pay all costs involved in restoration of such inventory, withinten days of invoicing by Lessor. Contents are inventoried, prior to occupancy. NON-SMOKING PREMISES:ALLPREMISES ARE NON-SMOKING. A minimum $250 fee will be charged for smoking inpremises. NO SMOKING may occurinside the Premises or within 100 feet of any living spaces. Guests may useONLY the outside patio areas for smoking. Please keep these areas clean of debris or cigarette butts. Anysmoking (cigarettes or cigars, etc) is absolutely prohibited inside the homeand will cause significant damage to the home, furnishings, furniture andbelongs, and may cause substantial damages including total forfeiture of theSecurity Deposit, or more. LOCK& SECURE PREMISES:When leaving the Premises,please make sure all windows and doors are closed and locked. METHODOF PAYMENT: We accept Cash (handdelivered only), Cashier Checks, Money Orders, Visa and Master Card. Personal Checks may be accepted if payment istendered fifteen days prior to due date for such monies. No foreign checks will be accepted. If checkis returned for NSF there will be a $100.00 service charge. Such additional services maybe provided, (if scheduled in advance), at a pre-arranged price, and aresubject to availability. Payments (cashor check) shall be made directly to the service providers. However, any failure to pay for such servicesmay be deducted from the above mentioned Security Deposit. UTILITIES:Utility fees are included inthe nightly rental rate which include heating/air, all gas and electric needsincluding Satellite TV, internet and applicable taxes. Guest agrees not to useany utilities in a wasteful manner. Please help us protect the environment, by minimizing utilities usage. RESIDENCE BELONGINGS/FURNITURE LOCATIONS: Some personal belongings, equipment,arcade games, audio visual equipment, furnishings, accessories, pictures,decorator items, are provided in home. Such can be utilized by Guests, however,please treat such as your own and do not abuse. Report any malfunctions to theLessor. In addition, if any indoor or outdoor furniture is moved by guests,Lessee is required to put all furniture back to its original location. Movingfurniture could cause damage to furniture so please use caution to not damagefurniture or areas of house while moving. SAFETY: Lessee shall be fully responsible for the safety of all individuals on, in, or near, the Premises during the term of this lodging agreement/lease. DAMAGES: Lessee is responsible for the actions or damage caused by any and all children, guests/invitees and pets. GRASS: No water slide, no bounce house or any other large items that would cover grass and create damage with not circulation to grass allowed for any period of time, unless approved for a special event. SPECIAL EVENTS/PARTIES: Guest is not to have any special event, outside vendors, staging, dance floors or activities on property without prior written approval. If such an event were to occur, Lessee will be responsible for all costs and charges associated with such an event and possible loss of security deposit. If the property should go on the MARKET FOR SALE, it may be shown to qualified buyers during the Tenants’ stay. Every effort will be made to schedule the showing at a convenient time and not interrupt the Tenant’s vacation. Lessee shall allow reasonable viewings of the home between 9 am and 8 PM present or not. Lessee agrees that Fireworks and other hazardous materials shall not be used in or around the property. Lessee is advised that there is no carbon monoxide detector on the property and accepts the risk involved in not having one. Lessee shall see to their own security while in the property by locking doors, windows, garage doors, etc. when it’s prudent to do so. Cable TV is provided and service level has been chosen by the Lessor. No refund of rents shall be given for outages, content, lack of content, or personal preferences with regard to cable TV service. VALIDITY:If any provision of thisAgreement is held invalid, such invalidity shall not affect the enforceabilityof any other provision of this Agreement. NO WAIVER: Lessor’s acceptance of paymentwith knowledge of any default by Lessor or waiver by Lessor of any breach ofany term of this Agreement shall not constitute a waiver of subsequentbreaches. Failure to require compliance or to exercise any right shall not beconstituted as a waiver by Lessor of said term, condition, and/or right, andshall not affect the validity or enforceability of any provision of thisAgreement. DISPUTE RESOLUTION:Claims, disputes or othermatters in question between the parties arising out of or relating to thisAgreement shall be subject to the Dispute Resolution Procedures set forth inthis Article. NOTICES OF CLAIM: If a dispute arises out of or relates to this agreement, or the breach thereof, the claimant shall first advise the other party of the details of the claim within ten (10) days from the time the facts underlying the claim became known to the claimant. The notice shall be in writing with sufficient detail and backup information to permit the other party to evaluate the claim. NEGOTIATIONS: Within twenty (20) days after notification of a claim in writing, a representative(s) of the Owner and the Lessee shall meet and endeavor to negotiate a resolution. Representatives of both parties shall attend with authority to settle any claim. MEDIATION: If a dispute arises out of or relates to this contract, or the breach thereof, and if the dispute cannot be settled through negotiation, the parties agree to try in good faith to settle the dispute by mediation administered in accordance with the terms of the California Uniform Mediation Act before resorting to arbitration, litigation, or some other dispute resolution procedure. shall be selected by mutual agreement ofthe Parties; if agreement is not reached on the selection of an arbitratorwithin fifteen (15) days of initial demand for such selection, then such arbitratorshall be appointed in accordance with the Rules. The arbitrator’s decision shall be in writingand shall state the factual findings and the reasons on which the decision isbased. The decision of the arbitratorshall be final and binding and such judgment may be submitted in accordancewith applicable law in any court having jurisdiction over the matter. VENUE: The location of any mediation or arbitration shall be held in Orange County, California. ATTORNEY FEES:If any legal action orother proceeding is brought for the enforcement of this agreement, or becauseof an alleged dispute, breach, default or misrepresentation in connection withany of the provisions of this agreement, the successful or prevailing partyshall be entitled to recover reasonable attorneys’ fees, and any other fees andcosts incurred in the action or proceeding, in addition to any other relief towhich such party may be entitled. INDEMNIFICATION: To the extent permitted by law, Lesseewill hereby indemnify and hold harmless Lessor and Lessor’s property, itsowners, management or employees, including the Premises, against any and all claims of personalinjury or property damage or loss arising from the use of the Premises,regardless of the nature of the accident, injury or loss. RELEASE:Lessor shall not be responsible orliable at any time for any loss or damage to Lessee’s or Lessee’s guests, orinvitees during this agreement for personal property. Lessee, Lessee’s guest or invitees shall useand enjoy the Leased Premises and all other portions of the Building andImprovements at its own risk, and hereby releases Lessor, to the full extentpermitted by law, from all claims of every kind resulting in loss of life,personal or bodily injury, or property damage. ENTIRE AGREEMENT:This Agreement constitutes the entireAgreement between OWNER and RESIDENT. No oral agreements have been enteredinto, and all modifications or notices shall be in writing to be valid. Details are what makes Miner's Camp special. The owners are passionate about selecting the right materials to create an authentic experience. They pride themselves on "American Picking" and restoring most of the era furniture themselves. All interior work was completed by the hands of local craftsman and trade. Outside the cabin you will be able to tour mine carts and equipment that have been donated by locals to share the history of the divide with you and your family. Miner's Camp has a covered outdoor cooking area and open area with fire pit for all guests to enjoy during their stay. We will be opening up an event room in the front area in Q1 2017 for guests to reserve for additional entertaining, rehearsal dinners, and corporate retreats. 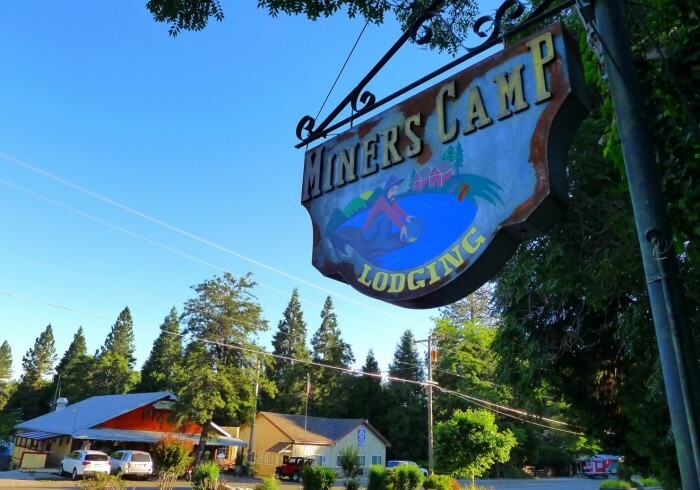 Close to wedding venues and outdoor activities, Miners Camp location on main street in the center of town makes for a convenient location for all guests.